The middle of December always seems like a strange time to put out a record, but that being said, if a release is good enough then people will find it and love it regardless. Everything Between Paint and a Wall is definitely good enough, and although it won’t make any end of year lists because of the timing (it deserves to) hopefully it propels Grandview onwards to bigger and better things in 2014, and I’ve no doubt it will. They released their debut EP Absolutely Nothing almost a year ago, and that worked out pretty well for them. Everything Between Paint and a Wall is a gem of a record. I should start with that, because it’s one of the many nice things I have to say on a very long list of nice things I could potentially say about Grandview’s debut album. This is a very positive review for a fairly negative record which covers relationships ending and is very self-reflective. Everything Between Paint and a Wall is about coming to terms with something and eventually accepting it, and it’s a moving listen from start to finish. There are still the huge tracks that ‘Pillars’ prepared an audience for earlier in the year, but the intimacy and passion that said song carried has been amplified massively, and the result is nothing short of stunning. Most tracks begin slow and brooding, before reaching gorgeous crescendos as vocalists Josh and Billy convey the lyrics with heartfelt honesty and spirit over melodic guitars and complex drumming. The song structure may seem overused, but Grandview are very good at building their music step by step and creating a thing of majesty, the same way you’d build a wall, and it’s clear on tracks like ‘Saw The Sky’ which unfold beautifully. 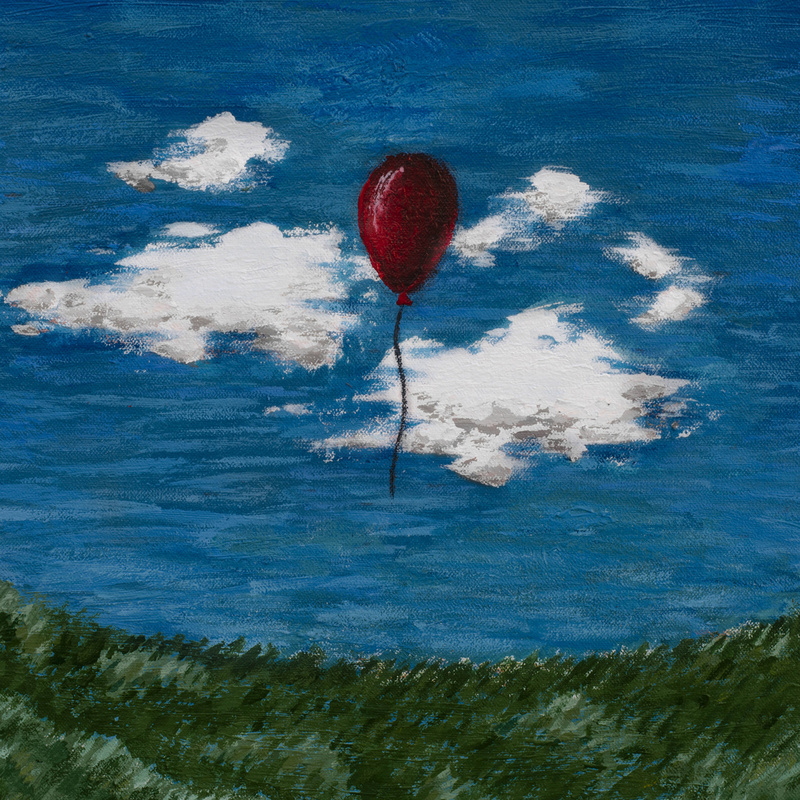 There are elements of Citizen and Seahaven, especially on ‘Sitting On Gold (The Latter’), but Grandview have made a unique album entirely their own which manages to surpass the genres heavyweights in terms of quality. Every aspect of Everything Between Paint and a Wall is excellent, but where the record really shines is through its lyrics. Soaking it all in and paying attention to what’s being sung makes the entire record much more immersive, because of the way the lyrics are written and the way in which this allows them to be communicated. Take ‘To The Sun’ and the line ‘I would give anything to recreate how our dysfunction used to function so beautifully’. Poetry like this is constant, and it makes Everything Between Paint and a Wall all the more affecting. You could pick a line from every song which makes an impact, and it’s rare for an album to be this well written. Even the spirited extract from ‘Death Of A Salesman’ on the appropriately named ‘Say Nothing’ works incredibly well, and there’s evident thought and pain been spilled into Grandview’s debut via the end of a pen. Given that the varied and technical instrumentals are capable of influencing similar levels of emotion, Everything Between Paint and a Wall is a very special record that definitely makes a listener feel something, even if most of the time that feeling is sadness. Hopefully you’ve gathered by now that Everything Between Paint and a Wall is brilliant, but there’s a moment on final track ‘Wall’ that it becomes much more, because you come to suddenly see the album as a journey that comes full circle on its finale. The hazy nostalgia of opener ‘Paint’ gives way to optimism and euphoria, making it a hugely appropriate way to cap off a record that spends a lot of its forty minute duration looking back and only allows itself to glance forward in its blissful final minute. This sense of reflective emotion that Grandview capture so well is what makes Everything Between Paint and a Wall so gripping, and it fades with the albums parting note. Everything Between Paint and a Wall is also a colourful record, both lyrically and musically, at its bleakest and most exhilarating moments. ‘In Good Company’ showcases them both superbly, softly lamenting ‘I will let you down’ before exploding into a barrage of comforting noise. Following track ‘To the Sun’ is the records longest, and easily its best, being an expansive emotive rollercoaster with a final verse guaranteed to ruin even the most hardened of men as the line ‘I can’t help but thinking that if we’re made in his reflection, did God drink himself to sleep the night he created me?’ is yelled out over surging drums and rising guitars. Pain has rarely been so well expressed, and this track in particular is where Grandview peak. Even ninth track ‘Shaper’ leaves a mark despite taking a more relaxed approach, drifting along on a haunting guitar melody whilst remaining poignant and well crafted. The delicate vocals of Ally Mahoney (who also features on ‘The Only Constant’) is a nice touch as well, as is the harsher vocals of Adam DaSilva on the more traditional ‘7’. Grandview have built a respectable name for themselves in the lead up to their debut full-length and Everything Between Paint and a Wall takes everything that makes the band so appealing and builds on it, making for one of the strongest debut albums I’ve heard this year. Considering it’ll only cost you $5 / £3.18 it’s more than worth your time and money, rewarding it tenfold. Buy it, enjoy it, and hope you don’t have to wait until December 2014 to hear more. McKayla Maroney would be proud.